We commenced business in 1976 with the setting up of tea auctioning at Kolkata. 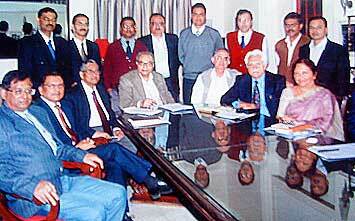 The Siliguri and the Guwahati branches followed in 1978 and 1984. Meanwhile the same business was also begun in Kochi, Coonoor and Coimbatore. Apart from the normal entrepreneurial motivation, what induced our entry into this business was a general impression in the trade that broking or auctioning needed an infusion of fresh blood. Since 1861, when the tea auction was introduced in India, after a century and more, several companies showed signs of obsolescence. Our entry had the effect of inducing reforms as well as to tone up, through competition, the quality of service provided by the other brokers. For example, the catalogues were reclassified with CTC, Orthodox and Darjeeling teas being offered separately. The separation saved a great deal of time spent by the buyers in the auction room. Computerization was first introduced at Contemporary and subsequently adopted by the others in the profession. About half of India’s production, which in the year 2008 amounted to nearly a thousand million, is sold by auction and the rest by private treaty. 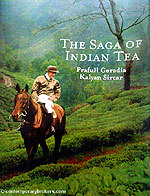 In 2001 the prospects of the auction system in south India were weak and several large producers were planning to market their own tea. We chose to withdraw by disposing off our branches in the south. 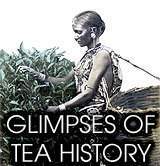 The production of tea in Assam, West Bengal and Tripura in 2008 totalled 735 million kg. Contemporary auctioned 72 million kg. in 2009/10 which was about 20 percent of the auction market. In 1986 the group in a separate company diversified into the manufacture of tooth brushes. By now the group produces some two hundred million brushes. Tea auctioning as well as tooth brush manufacturing were entrepreneurial projects. The question was how can the Contemporary group show its social concerns ? Late in 2001, it became possible to acquire a well situated south Delhi school which now teaches students from nursery to class XII. 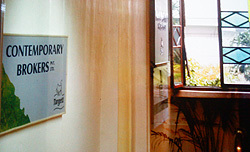 The school was originally founded in 1996. It has already sent out four batches to the CBSE class XII examination. The student strength which was under 850 in 2001 has now reached nearly 2000.